WASHINGTON — Facing a Monday deadline, the Justice Department asked lawmakers for more time to provide evidence backing up President Donald Trump's unproven assertion that his predecessor wiretapped his New York skyscraper during the election. The request came as the White House appeared to soften Trump's explosive allegation. The House intelligence committee said it would give the Justice Department until March 20 to comply with the evidence request. That's the date of the committee's first open hearing on the investigation into Russia's interference in the 2016 election and possible contacts between Trump associates and Russia. A spokesman for the committee's Republican chairman said that if the Justice Department doesn't meet the new deadline, the panel might use its subpoena power to gather information. "If the committee does not receive a response by then, the committee will ask for this information during the March 20 hearing and may resort to a compulsory process if our questions continue to go unanswered," said Jack Langer, a spokesman for Rep. Devin Nunes, R-Calif.
Trump's assertions have put his administration in a bind. Current and former administration officials have been unable to provide any evidence of the Obama administration wiretapping Trump Tower, yet the president's aides have been reluctant to publicly contradict their boss. 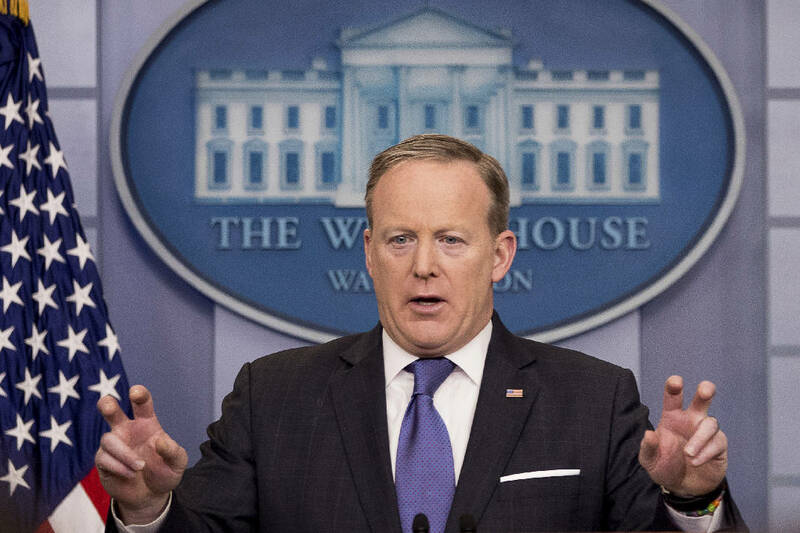 White House spokesman Sean Spicer tried to clarify Trump's comments Monday, saying the president wasn't using the word wiretapping literally, noting that Trump had put the term in quotation marks. "The president used the word wiretap in quotes to mean broadly surveillance and other activities," Spicer said. He also suggested Trump wasn't accusing former President Barack Obama specifically, but instead referring to the actions of the Obama administration. Trump himself has not commented on the matter since his March 4 tweets, in which he said he had "just found out that Obama had my 'wires tapped' in Trump Tower just before the victory." He also wrote: "Is it legal for a sitting President to be 'wire tapping' a race for president?" The president's accusations against Obama came amid numerous political questions surrounding his associates' possible ties to Russia. The FBI is investigating Trump associates' contacts with Russia during the election, as are House and Senate intelligence committees. The White House has asked those committees to also investigate Trump's unverified wiretapping allegations against Obama. The House committee has turned the matter back on the Trump administration, setting the Monday deadline for the Justice Department to provide evidence. In a response Monday evening, the Justice Department said it needed extra time to "review the request in compliance with the governing legal authorities and to determine what if any responsive documents may exist." Other congressional committees are also pushing the administration to clarify Trump's claims. Sens. Lindsey Graham, R-S.C., and Sheldon Whitehouse, D-R.I., asked Acting Deputy Attorney General Dana Boente and FBI Director James Comey to produce the paper trail created when the Justice Department's criminal division secures warrants for wiretaps. The senators, who head the Senate Judiciary Committee's crime and terrorism subcommittee, are seeking warrant applications and court orders, which they said can be scrubbed to protect secret intelligence sources and methods. Trump's critics have slammed the president for making the wiretapping claim on his Twitter account without evidence. Wiretapping a U.S. citizen would require special permission from a court, and Trump as president would have the ability to declassify that information. Sen. John McCain, an influential Republican, said Sunday: "I think the president has one of two choices: either retract or to provide the information that the American people deserve." "If his predecessor violated the law, President Obama violated the law, we have got a serious issue here, to say the least," McCain said. Comey has privately urged the Justice Department to dispute Trump's claim but has not come forward to do so himself. James Clapper, who was Obama's director of national intelligence, has said that nothing matching Trump's claims had taken place. White House counselor Kellyanne Conway sidestepped questions about the lack of proof Monday, saying she was "not in the job of having evidence." "That's what investigations are for," Conway told CNN's "New Day." "The president is pleased that the House and Senate intelligence committees have agreed that this should be part of the investigation that already exists about Russia and the campaign, an investigation that apparently has gone nowhere so far." In a weekend interview with the Bergen Record, a newspaper in her home state of New Jersey, Conway appeared to point toward the recent WikiLeaks release of nearly 8,000 documents that purportedly reveal secrets about the CIA's tools for breaking into targeted computers, cellphones and even smart TVs. "What I can say is there are many ways to surveil each other now, unfortunately," including "microwaves that turn into cameras, et cetera," Conway said. "So we know that that is just a fact of modern life."